How many episodes of Hellcats have you seen? I'd give it a 10 out of 10 if it wasn't for a poor pilot introduction where, after watching most of released episodes by now, I was hoping to see why has Marty, more or less, lightly considered getting into the squad. Other than that, I think the show is brilliant. Actors/actresses are good looking, all with different traits. Alice is mean, supercilious and selfish. Savannah is holier than thou, shy, fragile and uncertain if she fits in where she is now because of the influence her mother holds over her. Marty is pretty casual, humorous and always helpful. There are of course more interesting characters but where would the fun be in describing them all. As far as the acting goes, I consider myself quite a show-a-holic and I think it just can't get much better and I wouldn't ask for better, I'm not really seeing any major flaws. The plot itself is very unpredictable and will always keep you on your toes, and the music added to it will further spice it up. The problems major characters go through are pretty realistic. All that said, do not get fooled by keywords "cheer leading" and "teenager". This is so much more than that! 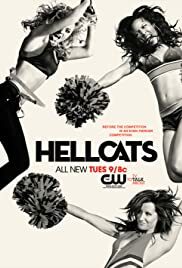 I hope I'll get to see more than a season or two of Hellcats.